When I was seventeen I did not think I would ever be married, and I really thought that by now “3-D” movies would be holographic, But most importantly I had no idea what I wanted out of my life. I had no idea how to make myself happy. The most important piece of the Me puzzle I did not have was what, exactly, I wanted to do with my life. What did I want to be? While I have never really believed in the theory of diminishing possibility, (if I wish to become a speargun-toting shark-hunter at ninety eight I will enroll in scuba classes and do it, dammit) I did have to admit that there were probably a few acrobatic/super-spy/ninja jobs that I might be growing out of the age-range for. Then, seven or eight years ago, and with my wonderful wife’s blessing, I got fired from my job and became a househusband. (I am surprised and amused that my autocorrect did not flag that word.) And even better, I became an illustrator/author for my own webcomic series. This lasted for five and a half years, and taught me the second best thing I ever learned: I do not want to draw a webcomic for a living. The first best thing? I love to write. So now, at forty four and eleven twelfths, I finally know what it is I want to do. I finally have the pieces of Me arranged in something that looks like a full, and happy person. Yes, it took a long time, and yes, I kinda wish it had happened earlier. But you know what? If it had, and it had been the wrong time, I might have missed it. I wouldn’t have been ready. So, for everyone out there who might have been in the same boat as I was, I am here to tell you, and to show you, that it isn’t always easy, and you should give yourselves a break. Relax. You aren’t supposed to know everything — not even about yourselves. Try stuff. Enjoy it. How do you think you’re supposed to know what you are going to love before you’ve done it? And try the PBJ-potato chip sandwich. That you will love. You were saying that you think of yourself as being younger than 45, reading your writing, it is my opinion that you come across as being somewhere in your early 20’s. Birthdays are a great time to review things. I have had a birthday fairly recently, and as part of the introspection I have done, I have recently quit my (well paying) job, and applied to go to college, and then University to become an engineer. However, while it may be that it has taken you a while to decide that you want to be a writer, it could just be that it wasn’t the right time. The courses that I have applied for are ones which have done once a few years ago and did poorly on. I feel more secure and capable now having more experience in life and time management etc. The thing with writing, is that you need to have more than just raw creativity, you need knowledge and worldy experience, so it might just be that for your time in life it has finally come to that point where you have everything inside you. 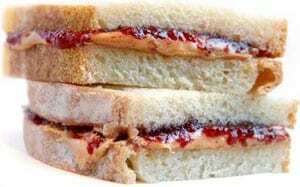 Oh, and about PB&J sandwiches, I really like peanut butter, I am ok with jelly jam, and chips crisps, but not all together. PB&C – good, but jam should be a separate entity. I do, however recommend peanut butter, bacon, lettuce, tomato and crisps (put the crisps in last so they stay crispy). Lena is the bacon-eater of the two of us. I’ll have to recommend that sandwich to her!